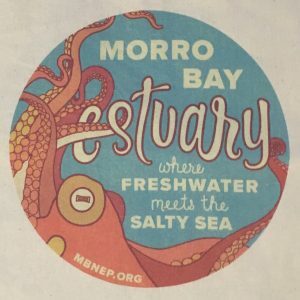 Give great gifts and support the Morro Bay National Estuary Program! 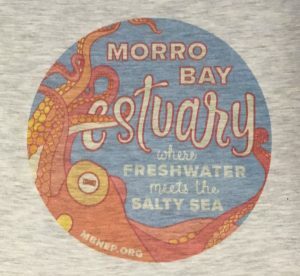 Purchase any item from our new Zazzle store or from the Estuary line of ESTERO gear and 10% of the purchase price goes to the Estuary Program. 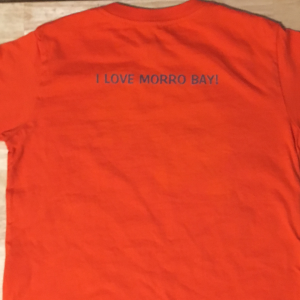 Those dollars help us protect and restore Morro Bay for people and wildlife. Thank you! 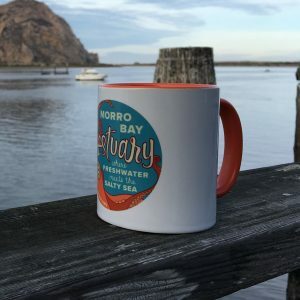 Find links to ESTERO and to Morro Bay Estuary Zazzle Store items below. 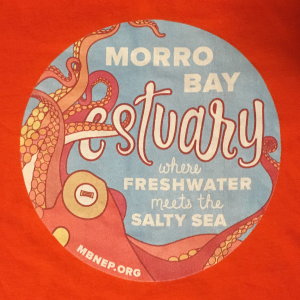 Purchase any shirt, hat, or hoodie from ESTERO’s Estuary line and they’ll donate 10% of your purchase to the Estuary Program. 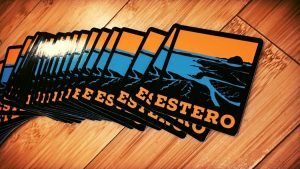 Purchase an Estuary decal, and 100% goes to the Estuary Program. Thank you, ESTERO! 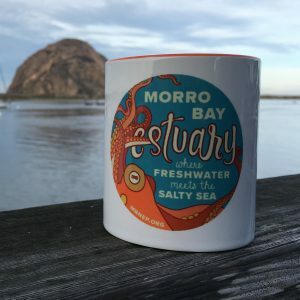 Purchase mugs, t-shirts, trucker hats, fanny packs, and tote bags that feature the Morro Bay Estuary Octopus, our Estuary Program logo, or our Mutts for the Bay logo. 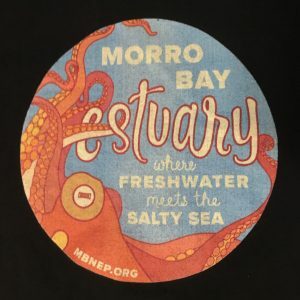 Please note that the items below have been designed by the Estuary Program, but are fulfilled entirely by Zazzle, which is an online retailer of customized products. The Estuary Program does not print or ship any goods. 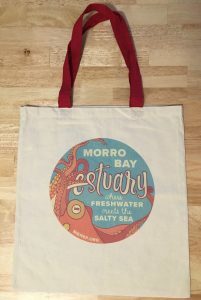 However, 10% of the purchase price of items you purchase through the Morro Bay Estuary store on Zazzle support the Estuary Program. Please see these items below! When possible, we have included pictures of the actual item so that you have a good idea of print quality on different surfaces and fabric colors. Please see those pictures first, before clicking each Zazzle link to order. Thank you! While our Estuary Octopus helps hold your beverage of choice, this colorful mug will brighten your day! The handle and inside of the mug are a bright orange. 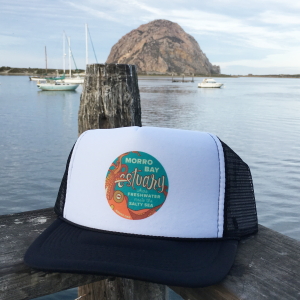 Keep the sun out of your eyes and a smile on your face with our Estuary Octopus Trucker Hat. 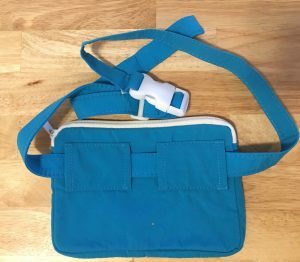 Fanny packs are back! Let our Estuary Octopus hold your essentials, leaving your hands free. Would you rather keep things under your hat than on your hip? No problem; our Estuary Octopus goes to great heights for you on our pocket visor. Need more carrying capacity? Size up for our Estuary Octopus tote. Printed on cotton canvas with a vintage-look and dark red or navy handles. Vintage-look Estuary Octopus available in men’s, women’s, and kids’ sizes on select colors and styles. Please see the following photographs of the Estuary Octopus print on grey and black t-shirt fabric for a more accurate representation of what your t-shirt might look like. Then, order your t-shirt using the links to Zazzle products below. 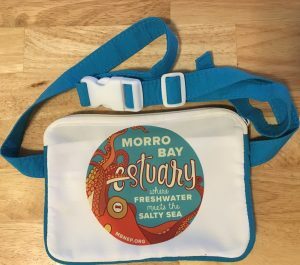 The Morro Bay National Estuary Program’s Mutts for the Bay program helps people and their canine companions keep the bay clean by providing free dog poo pickup bags. This keeps bacteria out of our waters, leaving them ready for frolicking and fun. Purchase Mutts for the Bay gear and support our work in the bay and surrounding lands!